Update: See the latest camp post HERE! It’s clear from all the questions I get… Houston parents want to know where to send their kids to camp! They not only want to know what camps are available, but they want recommendations from other parents. Below is an updated list of camps recommended by BigKidSmallCity readers and it will get updated frequently. If you want to suggest a camp, tell us! Listings below with “*” mean they were submitted by the school/camp rather than a Houston parent. If you are a Houston parent and want to endorse the camp, tell me! Update: See the latest camp post HERE! Find the FREE summer programs HERE. Swimming lessons, sports camps, VBS and more. Week long camps for kids ages 6-12 years old. Registration opens in February. Week long camps for kids ages 4-16 years old. Registration opens in February. Kinder – 12th grade. Very popular camp that opens registration the end of January, and usually fills quickly. Students take charge of all aspects of performance while the teachers (who are arts and educational professionals) provide guidance and know-how support to students (ages 4 – 18). Students write and stage their original theater pieces, creating their own roles, lines, costumes, and props. Week long camps with several options. Week-long camps with themes ranging from The Nature of Engineering to Bugs & Blooms, campers work together and independently to solve problems, perform experiments, play games, create imaginative crafts, and more. Camps are limited to 20 children each week, with 4 teen counselors assisting the Camp Instructor. Get outdoors with the Houston Arboretum & Nature Center this summer! The Arboretum’s Summer Camp is a great place for kids ages 4-12 to learn all about the natural world. 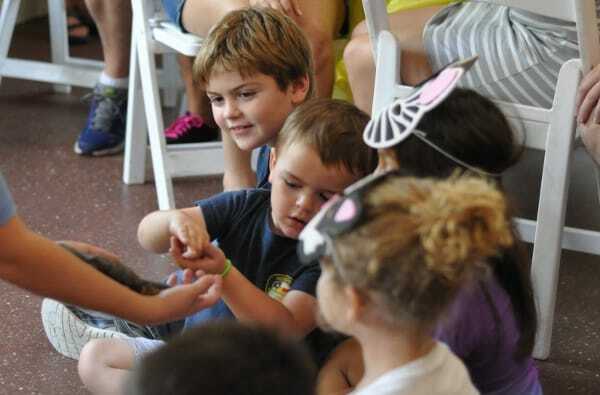 Spend a week in the life of a Forest Ranger, have some Fun in the Sun, get to know Houston’s City Critters, become one of Nature’s Inventors, or learn about local endangered species. At iD Tech, ages 7-17 learn to code, design video games, mod Minecraft, create with Roblox, engineer robots, print 3D characters, work with AI and machine learning, build laptops, learn about cybersecurity, and more! Held at University of Houston, Rice, The Village School, Stanford, NYU, and 150+ locations nationwide. This summer, your child can explore a prestigious campus, make new friends as they master new tech skills, and join a community of 350,000 iD Tech alumni. With world-class instructors and innovative courses in coding, game development, robotics, and design, our programs instill in-demand skills that embolden students to shape the future. Study Dorm’s Academic Summer Camp helps students get ahead in the upcoming school year or simply master concepts they might have missed during the previous school year. They provide math, reading, writing, STAAR and SAT prep classes for students in grade 1 thru 12. At H-Town Elite kids will spend the day utilizing the state of the art gymnastics equipment to work on strength, balance and coordination with certified USAG instructors. They also incorporate games and arts and crafts to keep kids motivated and interested all day long! Sign up for a half day, full day or all week! Introduce your little dancer to the FUN of dance at a one-week DANCE CAMP! Excite and capture the imagination of your dancer through these one-week camps include a themed dance class, crafts, stories, glow dance party, selfie station, manners and etiquette and a desert decorating “tea” party everyday! Ages 3 and 4 from 9AM-12PM & Ages 5-7 from 12:30-3:30PM. Kids can enjoy learning and laughter at our Pre-school and School-age day camps! Camp runs from 9:00am – 4:00pm each day with before and after care available. Sign up for a week of camp to receive a special rate or ask about daily rates. Kids are introduced to a wide variety of rock climbing skills including basic techniques, gear safety, commonly used knots and other climbing fundamentals. They also participate in daily organized workouts specially designed to help build a stronger, more flexible climber. This Leadership Retreat is a week long away camp, hosted at the Port Palacios Summer Camp in Palacios, Texas this year. Tuition covers round trip transportation to camp from Houston, all activities, room and board. Early bird discounts available, accepting ages 6-18. Character Camp’s Leadership Retreats instill leadership and character with the added bonus of robotics, aviation, physical fitness, music and math! Your kids will enjoy a week of camaraderie, intellectual stimulation and positive peer interactions while on a mini “vacation”. I would not recommend the Health Museum. The kids are kept in the same room all day & there are all sorts of administrative issues, e.g. no one checking ID at sign-out. Also, many parents might like to know that they don’t require immunization records. Handwriting and Yoga Summer Camp at Solaris Pediatric Therapy. It’s a unique, engaging camp that is simultaneously therapeutic and soooo beneficial to kids like my son – a smarty-pants who struggles with and is easily frustrated by handwriting (and by moms and teachers who try to correct him on the fly). They use the Handwriting Without Tears program, which I looked into purchasing for my son but found a little pricey. Bonus! By the end of camp we had a packet of HWT materials to use all year long. My kiddo’s handwriting needs work, which is why he will attend again this summer, but he no longer balks at writing-heavy assignments, and the time he spends on school work is about the work itself, not the difficulty of recording his ideas. And did I mention the yoga! He can’t wait to be in the studio with Ms Annette. “Yes! I love yoga!” was his response to my suggestion that we sign up again this summer. I am super excited for him, and super grateful that a camp like this exists. Thank you, Solaris.